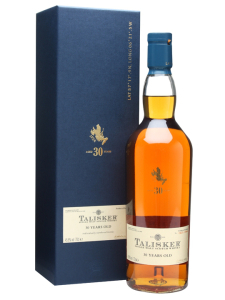 And now we come to the last installment of “Talisker: Barely Know her!” We’re ending with an oldy (but not the oldest) and a goody, Talisker 30 (2011 release). And again I get mixed up and buy the ‘wrong dram’. This was suppose to be the 2009 version, and I ended up missing out on the last of the drams. The difference between them is the 2009 is Cask Strength, and this one is ‘Talisker strength’. Which isn’t so bad. I mean, it’s not like they lowered it down to 43% or even 40%. Then it wouldn’t even be worth it. None the less, this is still something very interesting. It’s 30 years on the Isle of Skye saw lots of Angel’s Share fly away into the… is it a sea? Yeah, let’s say a sea. That sounds right.